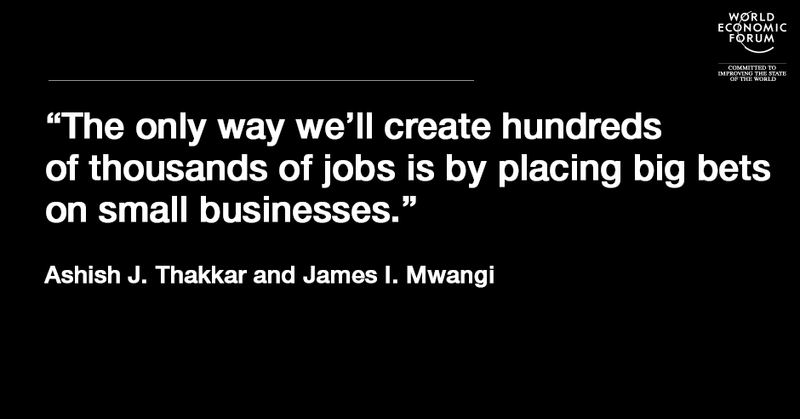 One of the great challenges for Africa’s leaders is creating meaningful employment for our young people. Almost 30% of Africans between the ages of 15 and 24 are neither in work nor in education, and almost half of those who are working are in what’s called vulnerable employment . 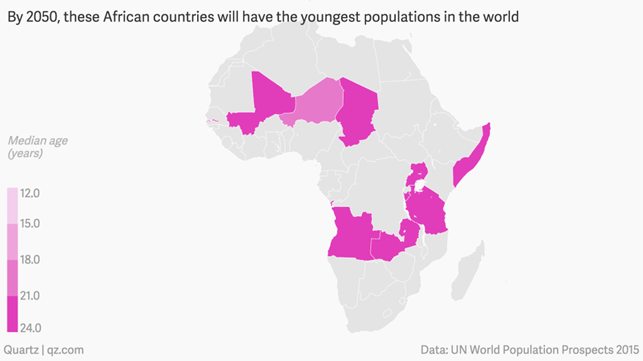 Reversing this trend would require the creation of 100,000 new jobs, and that number is expected to rise dramatically, as Africa has the world’s fastest-growing labour force. The only way we’ll create hundreds of thousands of jobs is by placing big bets on small businesses. Small and medium-sized enterprises (SMEs) represent 78% of jobs in low-income countries and more than 90% of all new jobs created each year . These businesses are the true global engines of employment. Increasing rates of entrepreneurship and accelerating the rate at which ventures grow is the only realistic path to creating enough jobs for the next generation. So how do we create these vibrant entrepreneurial ecosystems? It’s of course important to have the right policy environment, with appropriate tax incentives and labour laws, for example. But while this might be necessary, it’s not sufficient. Three other ingredients are needed to make sure entrepreneurialism can thrive. Early-stage capital is needed for entrepreneurial organizations to establish themselves, but it’s often not available in frontier and emerging markets. That makes it difficult for those without family money to become entrepreneurs. The past few years have seen a large increase in foreign capital in emerging markets. However, these investments are typically for deals in excess of several hundred thousand dollars, while early-stage entrepreneurs seek as little as $5,000. Innovations will be required in order to deploy small amounts of capital at scale; these innovations should be a priority for governments, investors and development partners. Opportunities exist to increase the availability of loans by developing new financial infrastructure (such as credit rating agencies) that reduces the cost of lending, or by introducing new models of deploying capital through business accelerators to leverage their client’s knowledge in reducing credit risks. It should also be possible to increase equity capital by bringing diaspora investment dollars home, and to innovate around crowd funding platforms. Most importantly, broadening the net of financial inclusion in developing countries could add hundreds of billions of dollars in savings, denominated in local currencies, to the pool of capital available for banks to lend to small enterprises. Effective and relevant mentorship is often crucial for helping entrepreneurs access the advice and support they need to overcome challenges and pursue their vision. When Ashish started his business at age 15, he was able to draw on encouragement and advice from a family with a long track record. Many budding entrepreneurs lack role models in their families and immediate social networks and falter in the absence of positive reinforcement and guidance. Creating effective and accessible mentorship networks around the world could unleash the potential of many who would otherwise give up. At the Mara Foundation, we launched something called Mara Mentor . The idea is to scale mentorship with an online platform and mobile application allowing ambitious entrepreneurs to connect with peers and business leaders. It empowers them to build their businesses and inspires them by facilitating a collaborative approach to business start-up and growth, while dramatically expanding the pool of mentors available to start-up companies. Another example comes from South Africa with Catalyst for Growth , an analytic platform for incubators and accelerators. Its objective is to more efficiently allocate the scarce resources that are available for business development services by driving entrepreneurs to those who are most able to help them grow their business. The right talent is crucial for growing ventures in the challenging environments of many emerging markets. Unfortunately, many of the best-trained and qualified people are directed towards the relative security and status of steady jobs in government and large corporations. At Mara Group, we face challenges when trying to attract talent, especially in our technology start-ups. For Dalberg, talent is both the biggest binding constraint to our growth and one of the most serious challenges facing our clients. As investors, we understand the risks in placing capital in young companies when few highly skilled people are seeking to become entrepreneurs and even fewer are lining up to become CFOs or marketing executives in early-stage ventures. Andela is a technology company that has sought to profit from this inefficiency. The company attracts high-potential technical talent in Nigeria and Kenya, puts them through a rigorous screening process (accepting only 1% of applicants), provides world-class training and then places graduates in technology companies for a fee. In South Africa, Harambee Youth Employment Accelerator is an NGO founded by a consortium of corporations to identify and train high-potential first-time workers for entry-level skills. They are now seeking to send graduates into SMEs by standardizing a set of common roles – such as sales clerks or bookkeepers – assessing and then offering training and jobs. Refugees also have role to play in addressing the talent gap. UNHCR estimates that there are 60 million displaced people in the world, many of whom are skilled workers . We believe that economies should allow their small businesses to capitalize on this talent and stop turning away skilled workers. Take the example of Chobani Yogurt. It was founded by Hamdi Ulukaya, a Kurdish migrant from Turkey, and is now one of the largest food service businesses in the United States. In 2008, he began staffing his Upstate New York plants with refugees and now employs over 300. And some of today’s most successful companies trace their roots to refugees, including Intel (co-founder Andy Grove fled Hungary to the US) and Marks and Spencer (co-founder Michael Marks fled Russia to the UK). Finally, more attention should also be paid to women entrepreneurs. Seventy percent of women-owned SMEs in developing countries are unserved or under-served by financial institutions . According to predictions from Goldman Sachs, increasing women’s access to capital can have a tangible impact on per capita income: if the gender credit gap is closed by 2020, per capita incomes could be on average 12% higher than currently expected across emerging markets by 2030. We believe that entrepreneurial ecosystems behave as a virtuous cycle, and that accelerating today’s entrepreneurs will pay dividends in years to come. Today’s entrepreneurs are tomorrow’s mentors and angel investors. As an entrepreneurial ecosystem reaches scale, financial, legal and educational structures can better support it. If we take the three steps we’ve spoken about, we will be creating an endowment of entrepreneurial talent that will help accelerate progress across Africa for years to come. This is not only a moral imperative for our generation, but also an attractive business opportunity.